Despite having a suspected broken shoulder, heroic Lanark United sub Hugh Kerr won a last minute penalty then scored an injury time winner in the dramatic 4-3 turnaround success at Thorniewood United, writes Craig Goldthorp. 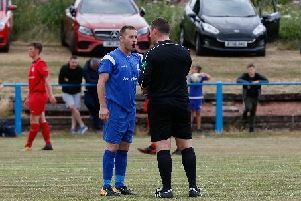 Saturday’s nailbiting win keeps United on course for the title as they sit eight points clear of local rivals Lesmahagow at the top of McBookie.com League Two, albeit with ’Gow having played two fewer matches. Delighted United kit man Craig Martin told the Carluke and Lanark Gazette: “That win on Saturday was our biggest of the season so far. “They were a strong team, getting the ball forward quickly and playing to their strengths. “With a minute to go they were 3-2 up and looked like beating us. “Scoring the penalty was great and then to get another goal in injury time was quite incredible. “There were really exhuberant celebrations after Hugh’s winner. “I think the reason for it was that getting the three points means that winning the league title iss still in our own hands, which wouldn’t have been the case if we’d drawn. “Hugh wanted to play despite the injury, which sums him up. With six games to play this season, United have accummulated 59 points. Second placed ’Gow have 51 points with eight games still to play, so the title looks to be on a knife edge with both teams on fantastic winning runs. “It looks like we need to win all our games left,” Craig added. “Starting with Muirkirk at home this Saturday (kick-off 2pm). “Thorniewood had something to play for last Saturday. “And it is the same this week because Muirkirk can still get promotion. The Thorniewood match saw Lanark take the lead after only three minutes at Robertson Park, when Lewis Hill sent a through ball to James Martin at the edge of the box and he controlled it before making space to fire the ball inside the keeper’s right hand post. The equaliser came on 15 minutes when Gary Livingstone’s shot came back off the post but hit the trialist keeper on the back before trundling into the net. But the home side took the lead on 32 minutes when Gary Stewart beat keeper Lauchlan Kirkland to the ball to head the ball into the net. Lanark were level again on 58 minutes when Cammy Lawson’s 30-yard free-kick beat the keeper inside his left hand post. Thorniewood regained the lead on 77 minutes when Declan Brown scored from close range Lanark looked down and out until the 86th minute when substitute Hugh Kerr was fouled inside the box and the referee pointed to the spot. Lewis Hill hammered the penalty into the roof of the net to equalise. The winning goal for Lanark came two minutes into injury time when Cameron Taylor sent an inviting free-kick into the Thorniewood box and Kerr took advantage of a free header to bullet the ball into the net.